Last week, my best friend and I went camping in Badlands National Park, South Dakota. It was an amazing adventure, and I have so many pictures that I have decided to chronicle it in multiple posts. The first post, counter-intuitively, is from the drive back to my home. We were at approximately Mile Marker 90 on Interstate 25 in Middle of Nowhere (maybe just South of Lusk) Wyoming, when we hit an incredible hail storm. Quarter-size hail slammed us, and even chipped my windshield. Of course I slowed way down, but there were drivers pulling off to the side left and right, ready to wait it out. Meanwhile, within 2 minutes’ time, the hail had accumulated to at least 2 inches deep. It was crazy. We were faced with a decision: to sit and wait it out, unable to see past the taillights of the car in front of us, engulfed by hail, encircled by deep purple clouds, or to gun it and get the f— out of there. Please keep in mind that my friend recorded the video, not me, I was driving like a responsible adult. And my friend who is a bit freaked out by tornadoes also began to babble. Instinct took over, along with a lot of f-bombs, and I put the pedal to the metal. We zoomed away from the tornado at 100 MPH. Normally, I try not to go quite that fast, but as you’ll see in the video below, the tornado touched down. What’s harder to see is that the tornado touched down only about a quarter/half mile away from us. Too close for my liking. Video is silenced due to aforementioned f-bombs. And also my friend’s incessant (and hilarious) repetition of, “Okay, but I think we’re past it” even though we clearly weren’t past it at all. She later told me she didn’t know why she said that, except that somehow she was trying to make it true by saying it. I thought that our adventure/brush with death was pretty impressive, but then I texted a picture to a friend who informed that my home city had endured 5 tornadoes that day. 5!!!! In the city!!!!!!! Usually, they happen much farther east, but apparently a big cell formed nearly right on top of my work. It drifted east, but still touched down in a large suburb. Crazy! Just when I thought I would wake up the next day with all the madness behind us, I was standing on the balcony at work about 2:30 pm, supposedly interpreting but there was no one around so I stared out the window. At the sky, and movement caught my eye. The clouds had already taken on that threatening greenish/purple hue that indicates hail and worse, and hail had already started to pelt the ground (and windows). But the movement was striking. It was right across the river, at the big tower of the amusement park over there. Maybe a quarter mile away total, give or take. I watched a purple cloud twist counter-clockwise, rapidly, like fast-forward, swirling. Almost like water down a drain. I couldn’t verify for myself that it was actually something to be concerned about, but I was very worried about my friend who was walking around the nearby downtown with less safe areas to take shelter (she ended up holed up in a bookstore, thankfully, and safe). So I sort-of frantically called for my coworker on the radio, figuring she grew up in Oklahoma and knew a thing or two about tornadoes. As I watched the larger part of the cloud swirl and congeal, I saw one dreadful spiraling tendril wind its way about 30 feet down, a thin little arm, towards the big tower at the amusement park. I knew immediately what it was, but I didn’t want to believe what I was seeing. Thankfully, it slurped back in a second later and the swirling subsided. By the time my coworker had come to check it out, and after sufficiently freaking her out with my description, everyone’s phone went off with “Tornado Warning.” We started to evacuate people to the safe hallways and stairwells, getting push back from higher up, saying that we couldn’t do anything until the city sirens went off. But we sort of ignored that and did it anyway, which was good because a minute later the city sirens blared. Half an hour or so later, we let everyone out, and congratulated ourselves on our skills at getting everyone safe so quickly. My friend and I drove through torrential downpour and flash-flooded streets to get Indian Fry Bread (YUM), then back home to eat it and watch a movie. Because how else should we celebrate life, really? PS If you’re wondering why I don’t start with the beginning, it’s because my friend and I accidentally switched USB cables for our cameras, so I have to go with what’s on my phone! 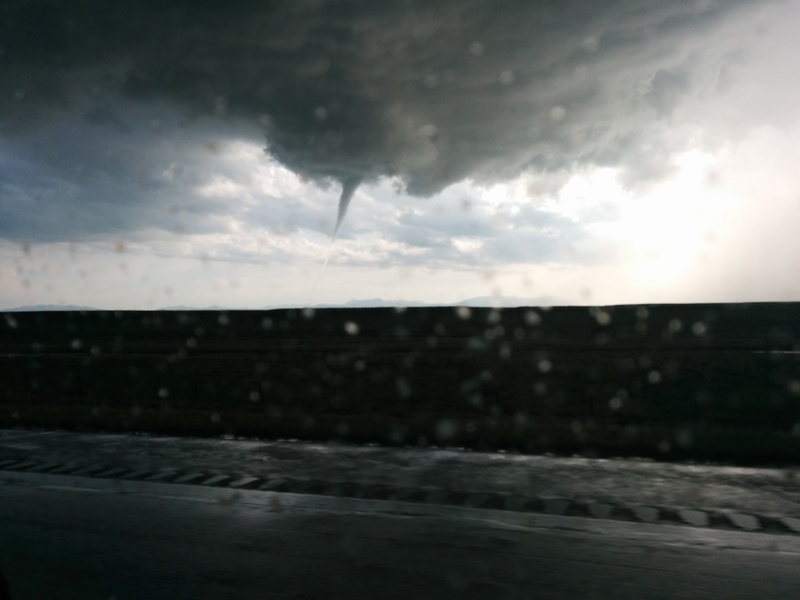 This entry was posted in Little Adventures, Writing Misadventures and tagged adventures, bad weather, crazy weather, hail, little adventures, near miss, Online Writing, photos, tornado, Vacation, vacation chronicle, video diary, wyoming. Bookmark the permalink.